Coal’s time is running out in Europe: deteriorating economics and stronger climate policies will soon make coal uneconomic, writes Silvio Marcacci of think tank Energy Innovation. Many European countries have already set an end date for coal power, utilities and investors are shifting away from it. The question is not if coal will lose, but when, and how well-managed its exit will be. 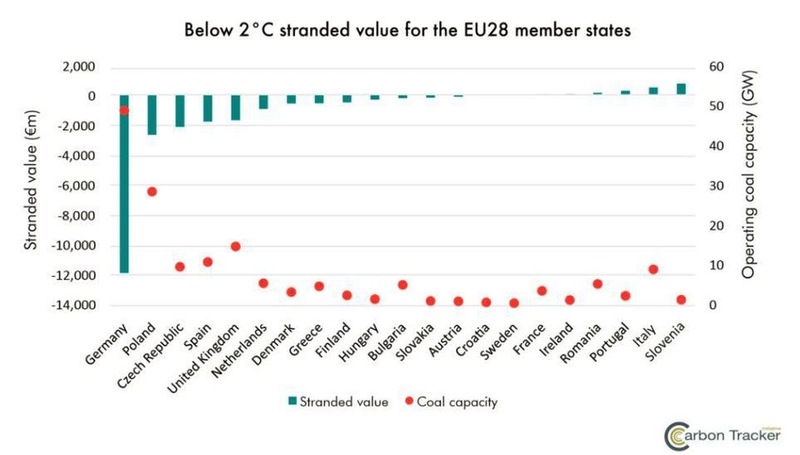 Deteriorating economics and stronger climate policies are squeezing European Union coal generation like a vise grip, closing power plants and threatening huge stranded asset costs. The symbolic beginning of the end for EU coal generation came in April when the United Kingdom, birthplace of the coal-fired Industrial Revolution, ran without coal for 55 hours then for another 76 hours a week later – the longest stretch since the 1880s in the world’s 5th-largest economy. Coal power is still running in many EU nations, but it could be rendered completely uneconomic – and obsolete – as soon as 2030. Forward-looking utilities and investors are planning accordingly, but how the EU power sector responds as a whole will determine if countries and their consumers are shouldered with billions in sunk costs. The EU trailblazed power sector decarbonization through policies like the EU Emissions Trading System (EU ETS) and feed-in tariffs in nations like Germany and Spain, but it still has around 280 coal-fired power plants in operation. More than 200 are 30 years or older, making them most likely to close when faced with stringent new EU emissions reduction targets, particularly those under the Paris Agreement. 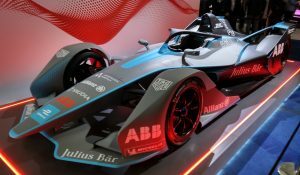 The EU’s nationally determined contribution (NDC) targets at least 40% fewer greenhouse gas emissions (compared to 1990) and 27% renewable energy by 2030, and EU members are proceeding apace. 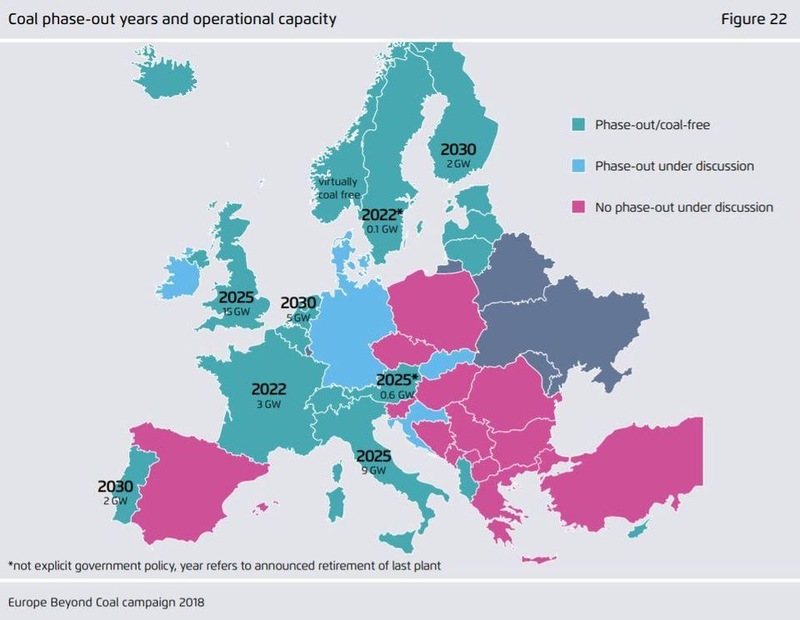 Eleven EU nations have either closed their coal fleets or have announced they will shutter all coal generation by a specific date, including France by 2023, Italy and the UK by 2025, and the Netherlands (home to Europe’s three newest coal plants) by 2030. These nations have 35.5GW operating coal, roughly 22% of total EU generation. Germany, Europe’s largest coal user with 50.4GW, will set an end date for coal power in 2019. 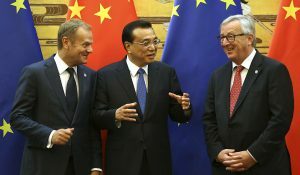 The EU ETS launched in 2005 and is the world’s largest operating cap-and-trade system, but its effectiveness has lagged due to a large carbon allowance surplus (the surplus nearly equaled total covered EU annual emissions in 2016) and low allowance prices consistently ranging between €3-€10 per ton since 2011. 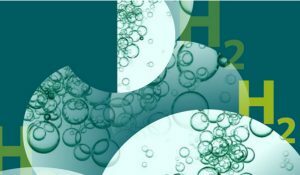 In addition to pricing emissions, the EU recently enacted rules to reduce nitrous oxide, sulphur dioxide, and particulate matter emissions from coal generation, giving EU governments until 2021 to enact them. 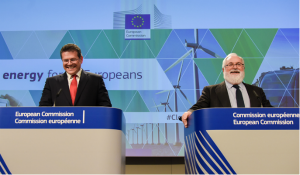 These rules would cut the €29-€54 billion in economic losses created by coal-fired pollution, and with 82% of coal capacity planned by 2021 requiring retrofits that could cost €15.4 billion, EU utilities are facing “clean up or close down” decisions. While the cost of coal power keeps getting more expensive, the price of renewable energy keeps getting cheaper. The levelized cost of energy for solar and wind fell below coal in 2017, making wind and solar the cheapest option for new generation, and reshuffling the power mix: The EU’s use of coal for power declined for the fifth consecutive year and was passed by renewables. Policies to meet the EU’s Paris NDC could double the EU’s share of renewable energy from 17% in 2015 to 34% in 2030. 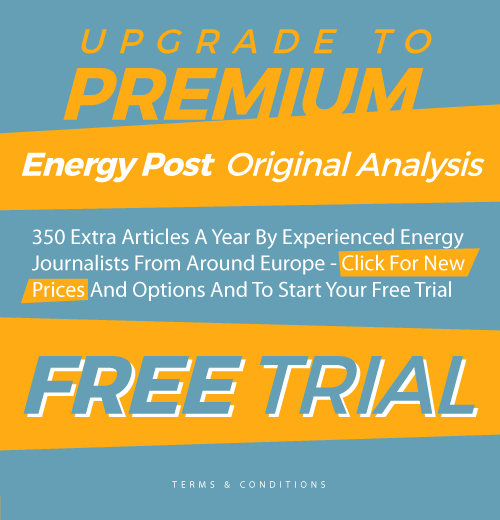 At least 2.5 gigawatts (GW) of unsubsidized wind energy and at least a dozen unsubsidized utility-scale solar projects are currently commissioned or under construction across Europe. 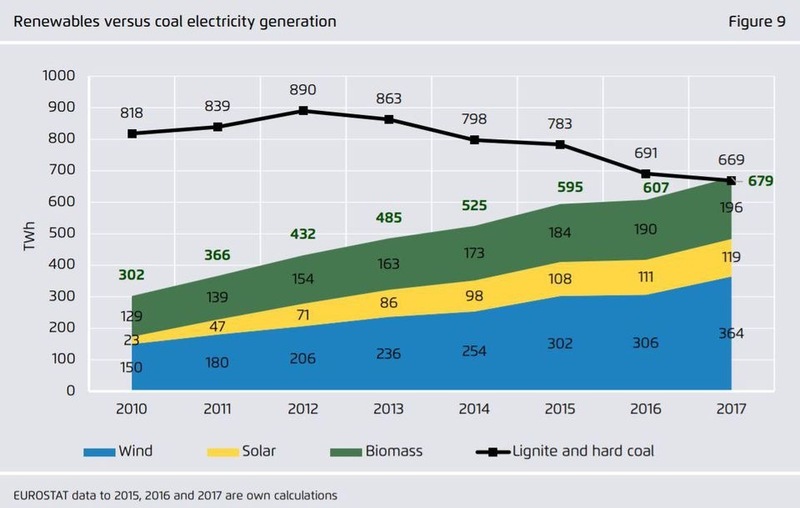 As renewables decrease power prices in the EU, growing shares of renewables eat into the amount of power coal plants can supply, and inflexible coal plants can’t comply with emissions goals, operating existing coal – not just building new coal – becomes uneconomic. Coal’s stark economic outlook is apparent in Carbon Tracker’s “Lignite of the Living Dead” report, which estimates the EU could avoid €22 billion in losses by phasing out coal power by 2030 in line with its Paris NDC. 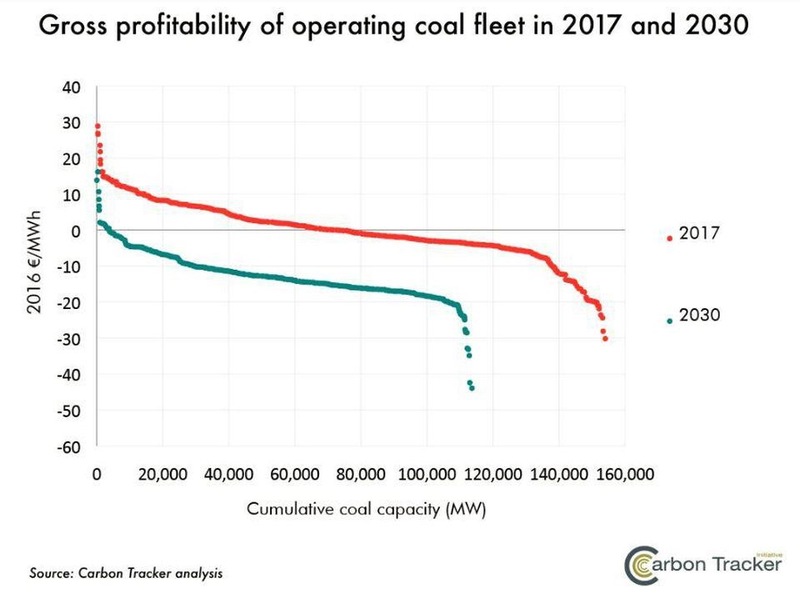 Carbon Tracker reports 54% of EU coal generation is cash-flow negative today, increasing to 97% by 2030, and coal’s operating cost could be higher than building onshore wind by 2024 and solar by 2027, all while energy storage and demand response increasingly cut coal power demand. Investors are adding even more economic pressure. In April, HSBC, Europe’s biggest bank, said it would stop financing new coal power plants to align with Paris goals, joining other EU-based banks like ING and BNP Paribas. In May, the Royal Bank of Scotland said it would stop financing new coal plants, and went even further by halting financing to utilities with more than 40% of generation from coal. These evolving energy economics create financial risks for utilities that own or are considering new coal. 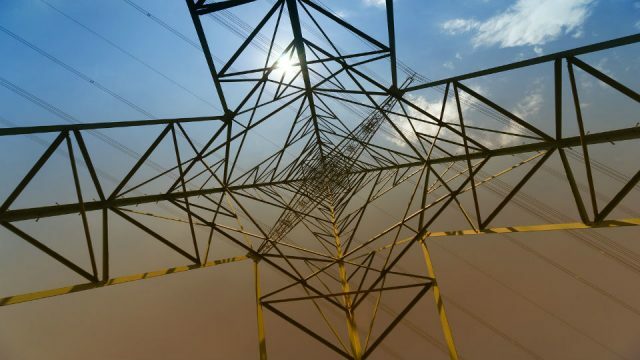 Moody’s cut the average credit rating of European power utilities three times on environmental risks between 2009 and 2015, and European utilities lost around 20% of their market (Stoxx 600) value between 2010 and 2016. Utilities have responded by shifting away from coal. While nearly 160GW of coal-fired generation is currently in operation across the EU, 71GW of projects were cancelled from 2010-2017, and coal plant closures have swelled. 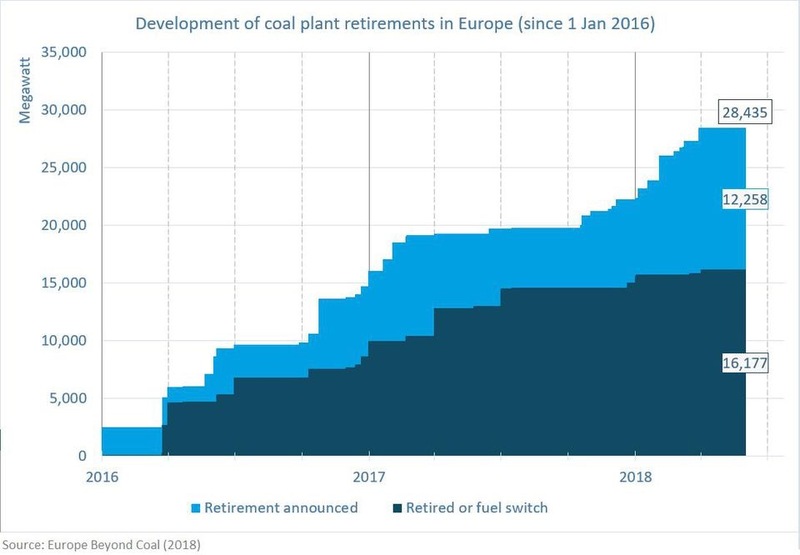 Since 2016, 16.1 GW of coal have retired, and another 12.2 GW have been announced for retirement for 28.4 GW total capacity, according to Europe Beyond Coal. What about the EU’s two biggest coal consumers? Most of the EU is shuttering coal, but its ultimate fate will likely come down to two countries: Germany and Poland. They account for 55% of the EU’s total coal generation, with nearly 80GW of operating capacity as of January 2018. Germany promised to set an end date for coal by 2019, and began a stakeholder process to set this target in early June. 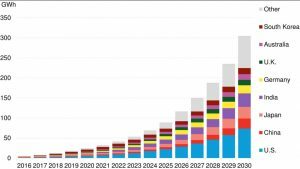 Germany is a global renewable energy leader with more than 101GW of installed wind and solar, but it still has 50.4GW operating coal with another 3.1GW either being developed or under construction, so the transition will take time. Poland has held back from embracing EU emissions reduction targets, for example vetoing a 2015 emissions reduction amendment to the Kyoto Protocol that prevented the EU from ratifying the treaty as a bloc. Despite already installing 6.4GW of wind capacity and planning up to 8GW of new offshore wind, Poland has 29.4GW operating coal and another 9.1GW either being developed or under construction. Carbon Tracker’s estimate of avoided EU economic losses from phasing out coal particularly impacts these two nations: Germany could avoid losing €12 billion by retiring coal units early and Poland could avoid losing €2.7 billion. The 2021 air pollution standards also loom large: 80% of German coal plants and virtually all Polish coal plants do not meet the pending targets and will need to be closed or retrofitted. Fortunately, both nations can decarbonize and avoid stranded assets. Germany’s Climate Action Plan 2050 calls for a 61%-62% energy sector emissions reduction by 2030, primarily relying on the EU ETS and electricity generation “based almost entirely on renewable energies.” Energy Innovation modeling shows that a package of 10 policies – in particular a power sector carbon price and renewable portfolio standard – can reduce Poland’s emissions more than 40% while generating more than €22 billion in economy-wide savings, and improving its energy security by reducing fossil fuel imports from Russia. As climate policies keep strengthening and renewable energy costs continue falling, coal generation is an increasingly risky venture in major economies from India to the United States. The EU is no different – coal’s time on the Old Continent is running out. Coal will be unprofitable and out of sync with EU policies across its 28 member countries by 2030, if not sooner. By embracing cheap renewable energy, utilities and policymakers can ensure the transition happens faster than expected, saving lives and money.